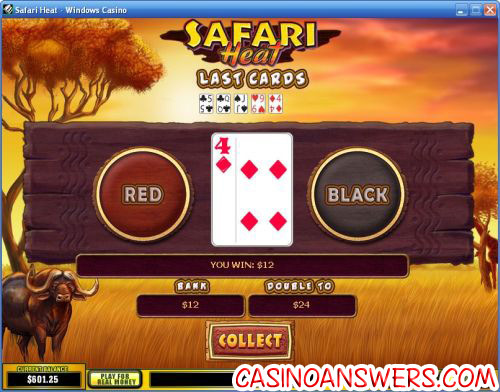 Safari Heat Video Slot Guide & Review - Casino Answers! Safari Heat is a 5-reel, 15-line video slot developed by Playtech. It features a wild symbol, a scatter symbol, a free spins feature with a multiplier and a gamble feature. 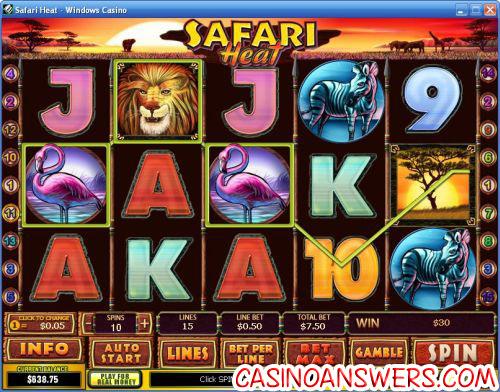 You can play Safari Heat at Bet365 Casino and William Hill Casino. Safari Heat is an African safari themed video slot. When you open the game, you will be immediately be dazzled by the amazing artwork in the video slot. The opening graphic shows a beautiful African sunset, along with two giraffes and two elephants. Inside the video slot, you will see more of this great artwork in the symbols. The symbols are mostly African animals including the lion, elephant, zebra, giraffe, flamingo, rhino and ox. There is also a scattered tree symbol and Ace, King, Queen, Jack, Ten and Nine symbols. Before you get started on the Safari Heat slot machine, you’ll want to set your own bet. First, pick a coin value. These are located at the left hand side of the game buttons, above the “Info” button. Options are $0.01, $0.05, $0.10, $0.25, $0.50, $1, $2 and $5. Once you choose your coin value, you can choose your line bet, which is 1-10X your coin value and the number of active paylines (we recommend leaving this at 15). Safari Heat gives players the ability to bet anywhere from one cent to $750 per spin! It doesn’t matter if you’re a casual player, regular player or high roller, Safari Heat will let you bet whatever you want! Once you have your bet ready, hit the “Spin” button to play and African music will play along with your spin. The wild symbol on the Safari Heat video slot is the lion symbol. He not only substitutes for all other symbols (except for the scatter symbol), he will double your winnings! Wait, that’s not all… He is also Safari Heat’s top fixed jackpot at 10,000 coins! When the wild lion symbol completes a winning combination, it will become animated. Safari Heat’s scatter symbol is the tree symbol. Three or more tree symbols and you will trigger 15 free spins with a 3X multiplier. This means that all of your wins during the free spins will be tripled. More free spins can be won during the free spins feature indefinitely. Two scatter symbols will pay out 2X your bet on Safari Heat, whereas on most video slots, two symbols will only pay out 1X your bet. After any win you receive in Safari Heat, you can hit the “Gamble” button to attempt to double your winnings. The game is simple. A card is laid face down and you have to guess if it will be red or black. The game will keep playing until you hit “Collect” or till you reach the double up limit. The limit will vary depending on the casino you play at. As an example, Windows Casino‘s double up limit is $750. You can find the double up limit in the “Info” section of the video slot. For players who don’t like to do a lot of clicking or want to do a lot of multitasking, the Safari Heat video slot has a basic autoplay mode. Simply hold down the “+” button under “Spins” then hit the “Auto Start” button to play up to 99 spins automatically. You may cancel Safari Heat’s autoplay mode at any time. Safari Heat is another very solid offering from Playtech. As we mentioned, the graphics are amazing, the sound is very nice and it has a decent number of features as well. To get a 100% up to $200 signup bonus to play Safari Heat plus over 150 other excellent casino games, please sign up and make your deposit now at Bet365 Casino! Are US players able to play the Safari Heat game? Unfortunately, Playtech casinos are not accepting US players due to the UIGEA. For a US-friendly online casino, please visit Bovada Casino. Does Safari Heat have a progressive jackpot? No, Safari Heat only has a fixed jackpot of 10,000X your line bet. For a similarly themed video slot with a progressive jackpot, please read our Mega Moolah Progressive Jackpot Review. What fixed jackpot slot machines are there?